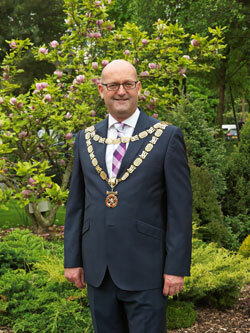 The new president of the National Association of Funeral Directors (NAFD) has chosen community as the theme for his year in office, and has urged members to get involved with their association. Simon Fisher, who was installed at a ceremony at the association’s AGM in Southampton, also pledged to “embrace the digital revolution” by becoming the first national president to use Twitter regularly. Simon told the assembled NAFD members and guests that funeral directors had always been a cornerstone of any community and would continue to be so. “Together, the funeral profession – represented here this morning by our kindred associations, suppliers and member firms – is one large community,” he added. He urged his fellow NAFD members to make the effort to get involved with their wider communities and also to come forward to take office within their association. Simon, whose career has encompassed the South coast, the Midlands and the West Country, singled out communication as the single largest ongoing challenge for the profession “whether that is ensuring we have the right details at 3am when a client wants our expertise, or whether we remember to tell the bearers to turn up at noon”. Despite confessing that his own communication had not always been 100% clear, particularly during his teenage years (when chatting up girls, he tended to describe his funeral work as being about ‘personal packaging’), Simon stressed the importance of clarity and openness. “We must continue to ensure the communication between ourselves is as good as it can be,” he added. Simon also thanked outgoing president Steve Pearce and his wife Julie for their “tireless efforts” over the previous 12 months.